How Modspace is modifying the Indian Home Décor Industry? Modspace.in, an online platform for furniture has world class designed kitchens and home products particularly modified to suit the different classes and taste of people. 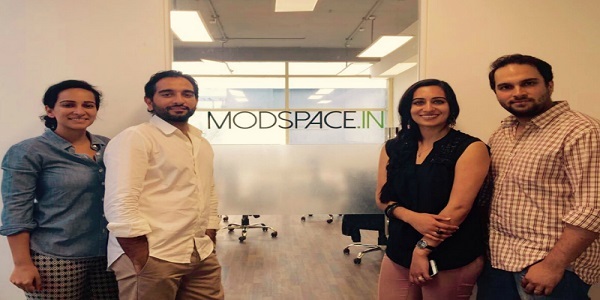 Founded by Jatin Paul, Avijit Marwah, Pallavi Paul and Mehaa Seth Marwah, Modspace currently is operated in Delhi-NCR. Offering fantastic items in moderate range price to serve the urban Indian homes, Modspace delivers the products at the doorstep of the customer and even offers 5 years warranty with life time after sales service. Why we chose Modspace as Startup of the Week? USP of Modspace is delivery of products at the doorstep of the customer and even offers 5 years warranty with life time after sales service. They have a 2-decade history of handling uniquely designed online furniture platform. Modspace has successfully booked its 100th order in Delhi-NCR region in just six months. The company plans to tap tier-2 cities with an introduction of new product categories. It has more than 30K fan following over Facebook. It all has happened in just 7 months. The idea of Modspace came when the founder Jatin was construction a home in Gurgaon. Attempting to get a nearby seller of kitchens and wardrobes who can design and deliver the product on time was weird to find. Another way to get the product was to get it from German or Italian vendors with 5 times more money than traditional. Then Jatin recognized the huge gap in the market space and then conceptualized the problem that was faced by every home buyer in India. Thus in June 2015, Modspace was brought into existence by a group of serial business people and experienced research experts with a reputation of building worldwide innovation organizations. They have a 2-decade history of handling uniquely designed online furniture platform. Every item at Modspace is totally fabricated at the brand’s own best in class fabricating office, which houses raw materials. There it is furnished and then its delivery process starts to give the customer a full pleasure like Germany or Italian products. Modspace gets clients through advanced digital channels and associates them with its in-house design team that uses its restrictive innovation to help them instantly imagine and customize the items they need to purchase. The company then handles the whole process – everything from manufacturing to delivery to the customer. The company with a team of 25 employees has successfully booked its 100th order in Delhi-NCR region in just six months. With an average product value of Rs 3-5 lakhs, Modspace is significantly contributing to the customized modular furniture industry in India. Modspace is looking to raising funds to propel its business and move to next phase of growth. The furniture business sector in India is growing day by day and according to an estimate, the current market size of home setup in the main 10 Indian metro cities is approx. $10 Billion, and the modular kitchen business size is growing with 40% CAGR. Modspace predicts huge development in this sector as the income and lifestyle of the Indians are growing day by day. Indian families take significantly more pride in owning their own homes. The company is focused on giving genuine quality of Modspace items. The future plans of the company includes adding new item category and grow more on their earlier plan. Doing good in the metro cities has inspired them to expand to more cities and now the company plans to tap tier-2 cities with an introduction of new product categories.